The Instituto Poligrafico Zecca Dello Stato (Italian State Mint) have announced the issue (18th July) of a coin which marks the cultural connection and historic links between Italy and Russia. The coin is issued as a 10 € silver proof quality issue and is the work of designer M.A Cassol of the IPZS in Rome. 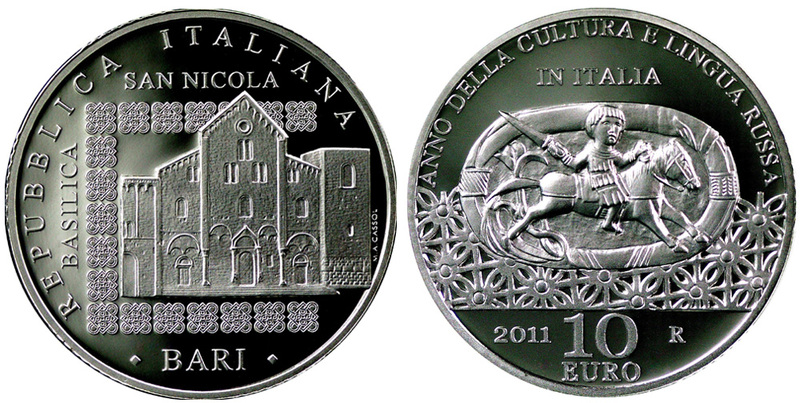 The coin features the Church of St. Nicholas located in Bari, a coastal city in Puglia. Built between 1087 and 1197, the basilica is an important pilgrimage destination both for Roman Catholics and Orthodox Christians from Eastern Europe. The church was built on what was previously the residence of the Byzantine Governor’s Court and thus, much of the pre-existing building materials were re-utilized for its construction. The Basilica of St. Nicholas itself safeguards the Saint’s relics and stands impressively in the Old Town overlooking the Adriatic Sea. The obverse of the Italian coin shows the detail from the external façade of the Basilica framed within modular elements drawn from the mosaic decoration of the tower to the south-east of the Basilica. On the left is the vertical inscription BASILICA and above SAN NICOLA, below the location, of BARI is included and around the outer rim of the central design is the inscription REPUBBLICA ITALIANA. The reverse includes detail from the sides of Elias’ Episcopal throne which is housed in the Basilica. In the centre, is a depiction from the main portal featuring a warrior on a horse. The coin is struck in sterling silver with a weight of 22 grams and a diameter of 34 mm. A mintage of just 7,000 pieces have been authorized. For more information on this and other coins and annual sets from the Italian State Mint, please visit their website at: http://www.zecca.ipzs.it/ The ordering information is available in both Italian and English. This coin is issued as a joint effort with the Central Bank of the Russian Federation. The description of the Russian coin can be found here.